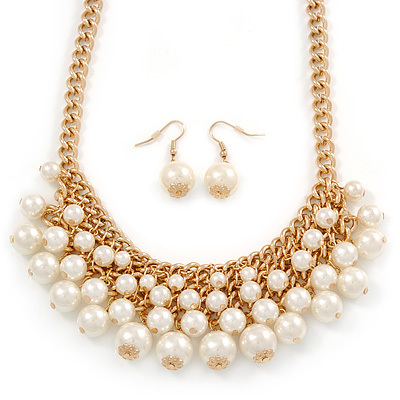 Give your jewellery a touch of class with this stunning Gold Plated Cream Faux Pearl Bib Necklace and Drop Earrings Set. The necklace features a bib style design, crafted in gold plated metal and decorated with cream coloured faux pearls. The piece measures approximately 40cm in length and has an additional 8cm extender that fastens with a lobster claw clasp. The matching earrings have 35mm drop, with the shepherd's hook fittings, suitable for pierced ears only. Each earrings weight is about 2g. A beautiful set to wear for special occasions, weddings and ideal bridal jewellery for brides and bridesmaids.